You are here: Home / Fees and rebates / How many sessions do I need? In general we recommend six counselling sessions to begin with but on many occasions more or less are appropriate. We believe that patients can take an active role in determining how many sessions are needed, depending on your goals and level of distress. While we’ll make recommendations you are ultimaltly in control. While we don’t know how many session you will need before we meet you, we can get a pretty good idea of when more sessions are likely or unlikely to yield further benefit. This graph shows that people’s K10 scores, which is indicative of psychological distress, reduced for everyone who had between three and 15 session. 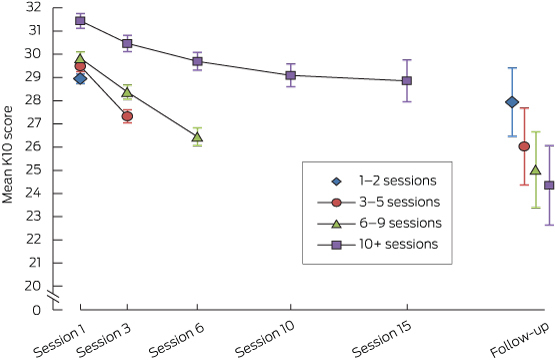 You can see that people who had 3-5 sessions had the fastest response (red), those who had 6-9 sessions had the biggest initial response (green) and those that had 10-15 sessions has slower improvement (purple). The reason for the latter finding is because people who stayed in therapy longer were also the ones with the most distress to begin with. i.e. They needed a “higher dose” because their symptoms were more severe. Interestedly, the “follow-up” measure completed months after leaving therapy showed that all patients had reduced distress after they left therapy, except for those who attended just once or twice (blue). Therefore, one or two sessions are rarely recommended because it probably won’t help. The sustained improvement after therapy ends is a major benefit of therapy compared to medication. When you stop taking medication the benefits stop. With therapy you can continue to use what you’ve learnt and therefore continue to improve. Those that had the most number of sessions (purple) were able to sustain and improve their functioning far more than those who only attended a few sessions. While the above graph doesn’t show it, on some occasions long term therapy (30+ sessions over a year or two) can also be appropriate, and there is compelling research evidence that this is effective for particular diagnoses or people with severe distress.